Online Examination Date Sheet : Online Examination will be held on same day by all participating RRBs between 22nd August 2015 to 5th September 2015. The lower and upper age indicated for a particular post (s) in the vacancy table (Check official advertisement below) will be reckoned as on 01/07/2015 . The upper age limit relaxable as per Government norms. Candidates should have requisite Educational/Technical Qualifications (as indicated on vacancy table) from recognized board/university/ institutions as on the date of submission Online application form for RRB CEN 01/2015. Those awaiting result final examination need not apply. Candidates who have obtained Diploma /degree through distance mode except AMIETE & AMIE are not eligible to apply for RRB CEN 01/2015 JE & SSE Jobs. 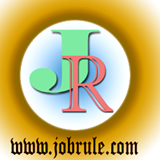 Candidates are required to Apply online to any One RRB Only, separately for SSE and /or JE group ,depending upon eligibility , on the website of the Railway recruitent Board (indicating on para 16 of official advertisement) Details of Online Application Process/Procedure available on Official Advertisement (Direct link given below). Must Remember, Only Online Application are accepted. No other mode of application form submission not accepted. 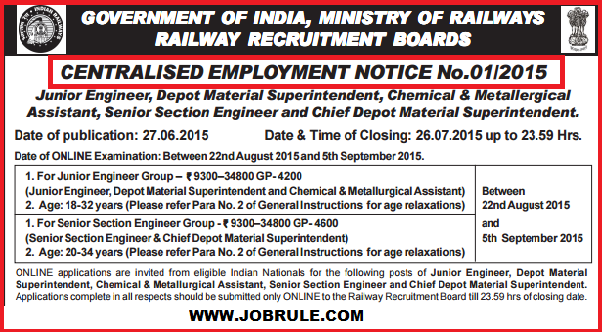 Applicants must have to Apply Online through Respective RRBs Website Only(Where they want to perform his/her Job). Online Application link are available on respective website only.